All credit for this goes to @EvilWulf for this. I’m just the hype-man here. In the wake of his #QCipher program, we spoke about the possibility of creating an interactive QClock program – and lo and behold – he actually managed to pull it off. This program is awesome and I don’t say that lightly. Here’s a screenshot I took from my desktop. Now, this is a beta version of the program – so if you encounter any bugs or issues, talk to EvilWulf – but the beauty of this is it’s straightforward simplicity. It does exactly what you want a QClock to do. 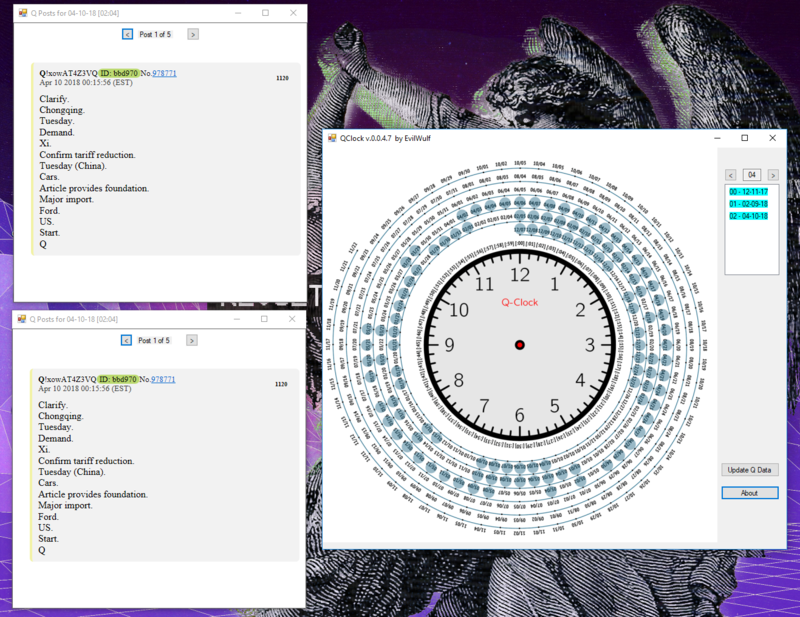 What QClock allows you to do is navigate to a certain date, and pull up all corresponding #QAnon drops from that date. So in the screenshot, you see the field up top marked “04.” That’s where you input what time you want, from 0 to 59. Below it, highlighted in blue? Those are the corresponding days Q posted. So for day “04,” Q posted on 12/11, 02/09, and 04/10. If there’s a date, but it’s not highlighted, then there were no posts for that day. To actually see the posts from a day, all you have to do is double click on the day. 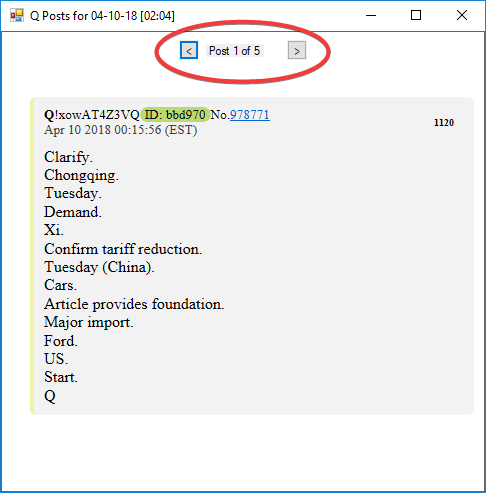 That will open up a little window with the Q post inside, as well as the number of posts up top. That little selector lets you see not only the number of posts from that particular day, but allows you to cycle through all the posts. 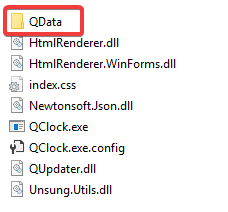 You can open as many of these little windows as you want at any time, to display any amount of Q drops. 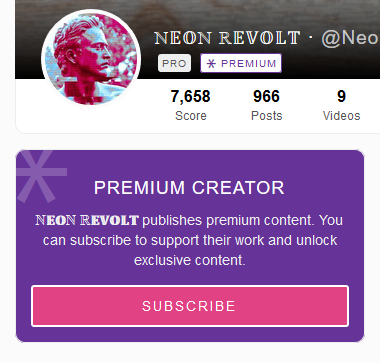 All data is pulled from Qanon.pub, and the genius bit about it is – if Q comes back and drops more intel – all you have to do is his that little “Update Q button” in the main window to pull down those posts to the program. Note: This is a Windows-only program right now. Sorry Gnufags and Mactards. Maybe if you buy EvilWulf lots of beers, he’ll port it over! XD In the meantime, you’ll have to emulate. And while I wasn’t able to perform a code-audit on this one, I didn’t get any red-flags from any of my scans, and I trust EvilWulf enough to not pwn my system. Maybe if you’re super paranoid, set up a tails-based VM or something you can run on an arduino from your underground survival bunker. Unzip it into a new folder. I named mine “QClock,” naturally. Open up that new folder. The program will “think” for a minute or so, while it downloads all the Qdrops from QAnon.pub. Once its done with that, you’re good to go! Guys, this is going to make referencing the clock, and creating infographics so much easier. I really hope #Anons find this as a valuable tool, because I know I sure do. Alright, that’s it! Once again, all credit goes to @EvilWulf for this, so show him lots of love for this. It literally couldn’t have happened without him. For the record… I prefer Woodchuck over beer. Ahhh Woodchuck- Yessss You and your clock are ok by me!! All hail @EvilWulf, the king of inventive nerdy greatness! EvilWulf you’re quite the handy man! Thank you! We all only do what we are able to do. I can’t put together a story or do the exhaustive research that Neon does, but I can write code. So that’s what I do. EvulWulf in the “Mirror” = Righteous Lamb !!! Interesting, I am gonna try it in Wine (Linux). Source code would have been nice. Oh well. Written in C or C++? Using Windows functions or open source? I can help, if not all Windows crap. In other words… It’s all Windows crap. Well, Mono is C# on Linux. Actually, it is Microsoft Open Source crap. It works pretty good most of the time. About as good as it does on Windows, I think. We could give it a shot and see. C# is like C or C++ but with it’s own open object libraries. I totally dislike Microsoft and Apple!! Matter of fact, I think Mono is on Mac too! Should be. It’s unix, too. I tried running QClock with wine and no joy. I get the little first window and then it’s gone. I tried running it with MONO and it got further but then MONO couldn’t find the timezone file and quit. I looked and it appears to be a bug in MONO. Sorry… I really wanted to try it. I might install it in Windows 10 under VirtualBox and see how it works. That ought to be OK.. Just a pain is all. It looks like a coolo app! Read the setup instructions. You have to make a folder to store the QAnon data. Sounds like you were really close to getting it to run. Well, I did make a folder. That was the first task. It was after that, it failed. Hmmmm… I’ll try again. Thanks. That actually does sound like an issue with MONO. If it doesn’t have the correct equivalent of the TimeZoneInfo class from the .Net framework, that would kill it before it finished the Update process. Dang – if it were written in Java or python, it could run everywhere. I’ve written some C# progs on Linux, but the whole windoze forms thing would probably make it difficult to Port. Amazing! excited to try it out. Thanks so much to both of you. Calling me a Mactard is not Politically Correct. After I recover and come out of my Safe-Space I will report you to…someone. Maybe Hillary. have you checked the clock with the posts that mention suicide ? Woodchuck Pear is my favorite! Mactard? Well, there are a lot of Mactards that would appreciate being taken in to consideration to making this available to them. Like moi. Not a ‘puterfag here but surely it can’t be that difficult to accommodate us. With the exponential growth of Q awareness on the horizon it seems a Mac version is imperative. Please don’t treat us like a ‘stepchild’. We have feelz also. Great job NR on defending yourself on 8chan this evening. Thank you Evil Wolf and you too Neon!! You guys rock! EvilWulf what is a woodchuck? I will get you 2 if you make MActard version. Love your stuff, Neon and never doubted you for a second with all the ETS crap. This clock is a piece of work indeed. This could be the turning point of regular folk like me, who read but don’t ‘really’ research/investigate quite as much as we should. If this clock were to get much more attention with concise, well written, easy to use instructions inc. examples etc. the whole planet could get red-pilled and become investigators in their spare time opposed to watching brainless TV. It could be what we need for a worldwide revolution and for the evil ones to see the guillotine, quick time! A nobody with a suggestion/request… First, love it! Second wish it was universal like qmap.pub Third could it be web based? Finally, fantastic stuff! I see smiles from above and abundant blessings awaiting you. Yep, that’s what I got too. GTK or QT.. It got further in MONO, but not much! Just in case you missed it, I posted a response to this in my blog’s comments with a possible fix for that issue. This sounded like such a great tool! However, after spending two hours trying to find an app that would open it, being forced to get a microsoft email acct and pw, an app finally downloaded that wld open the file. THEN after all THAT, the comp firewall said it had a virus and quarantined it. DARN. So disappointed . Was really lookig fwd to seeing this great tool in action. All you needed to open it was 7zip lol. Wonderful idea Evil Wulf. Something that will make things a lot easier as we go along. Since Q is always saying “you have more than you know.” Maybe this gem will help us crack that too! I know you just announced this; is there any thoughts of tweaking it, for Android users? I tried Dropbox and Inno Setup Extractor with zero luck. I guess its those pesky .apk’s. Or do you have another way to open your invention? I’m on a Samsung galaxy note tablet. I know others are only using their phones. Any enlightenment would be greatly appreciated. Thank you. Meeting Trump-Kim. Future proves past knowledge.